The CPU or Central Processing Unit is where all the program instructions are executed in order to derive the necessary data. The advancement in modern day CPUs have allowed it to crunch more numbers than ever before, but the advancement in software technology meant that CPUs are still trying to catch up. A Graphics Processing Unit or GPU is meant to alleviate the load of the CPU by handling all the advanced computations necessary to project the final display on the monitor. Originally, CPUs handle all of the computations and instructions in the whole computer, thus the use of the word ‘central’. But as technology progressed, it became more advantageous to take out some of the responsibilities from the CPU and have it performed by other microprocessors. In the days before GUIs, the screen was simply a small grid with each box having an 8bit value that corresponds to a character. This was relatively very easy to do for the CPU, but GUIs have greater resolutions with each pixel having a 16bit or 32bit color value. GPUs where originally developed to render 2D graphics; specifically, to accelerate the drawing of windows in a GUI. 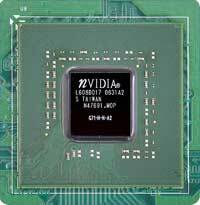 But as the need for 3D and faster graphics acceleration grew, the GPU became faster and more specialized in its task. GPUs are now generally floating point processors that can easily crunch geometric computations along with texture mapping tasks. Most GPUs have implemented MPEG primitives to make enhance the playback of videos; some even have the capability to directly decode HD video data, taking another task away from the CPU. Hardware wise, GPUs and CPUs are similar but not identical. If we looked at the very building block of each, the transistors, we can see that most GPUs already rival CPUs in transistor count. The specialized nature of GPUs means that it can do its task much faster than a CPU ever can, but it is not able to cover all of the capabilities of the CPU. Multiple GPUs can also be employed to achieve a single goal much like the dual core CPUs currently available. ATI’s Crossfire and NVidia’s SLI allow users to connect two identical GPU’s and make them work as one. 1. CPU is the brain of the computer the GPU is only meant to complement it. 2. GPUs are specialized and cannot replace the function of a CPU. 3. CPUs can perform the functions of a GPU but at a much slower speed. 4. GPUs can rival CPUs in transistor count. 5. GPUs can also work in tandem just like the CPU’s multi core capability. Ben Joan. "Difference Between CPU and GPU." DifferenceBetween.net. May 19, 2011 < http://www.differencebetween.net/technology/difference-between-cpu-and-gpu/ >. Thx 4 ur valuable infos. Although I expected more figures of data flow etc of CPU & GPU as well to uderstand it properly, nt only in text format.. As I’d seen in dIGIT magazine earlier. If u’v more info abt this & related topics thn I’ll b thnkful if u send those valuable infos to my email. If you have more information about it then please send me on my email ………. Thanks for this explanation very interesting. Thanks again.